Our favourite time of year is just around the corner and we’re starting to get in the spirit of things here at Lipstick, Lashes and Locks! 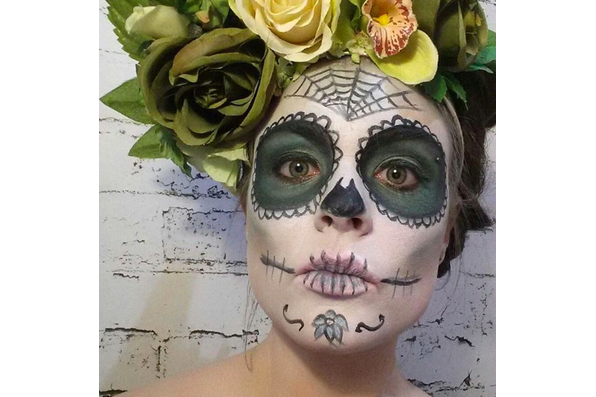 We’re always super excited when people come in for a spooktacular makeover, and we can’t wait to see what comes from our client’s requests this year. Stiletto nails have become a really popular way to sprinkle a little bit of wickedness into working weeks for October, sharp conturing has become frightfully chic for the big night, and mermaid hair . . . well that’s so off the scale cute that it is worn all year round now! Here’s a little introduction to our team and there terrifyingly terrific talents… Beware, our appointment book is filling up frightfully fast, so if you’re after a booking you better get in there quick! 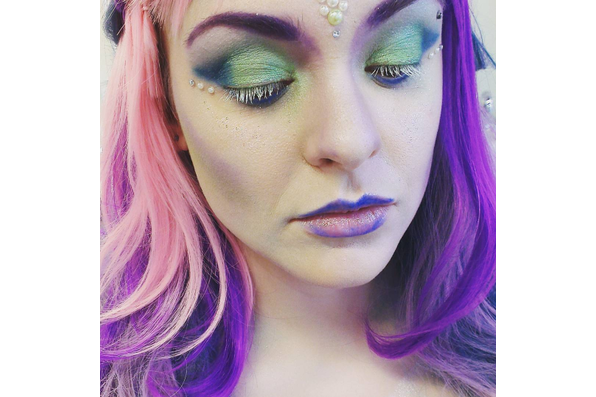 Jenny, our majestic makeup artist and beauty parlour queen has been creating some absolute masterpieces using only the best products. Lately she’s been working on Mermaid make overs and Harley Quinn, Day of the Dead, and Maleficent make up, but she’s always up for a new challenge! Whether you’re looking something naughty or nice she’d be more than happy to chat things through with you and work with you to create something that’s perfect for the occasion. Because you don’t have to go O.T.T. to look F.A.B.! Gemma, our latest team member and lady boss of nail art and Gel extensions, has been giving devilishly delicious Gelish (gel nail) polishes to her clients. Using pop art and comic nail wraps, glitter polishes and hand painting the finishing touches (to styles like this fabulous Queen of Hearts nail set! ), she’s been introducing a bit of fun onto fingers for Halloween. We love how quickly a beautiful set of nails can turn an outfit from drab to rad without breaking the bank. If you’re looking to add a wee injection of glamour that won’t interfere with your office job, this has got to be the ultimate way to do it! 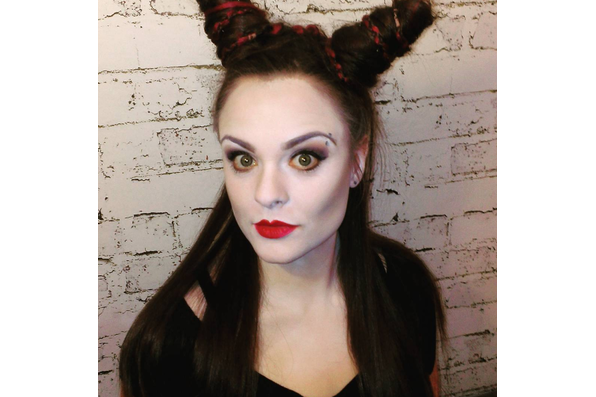 Loretta, hair colouring queen, has not only mastered the perfect natural highlight and regrowth cover up, she’s also ghoulishly good at creating the perfect colour combo’s for full heads of hair and dip dye’s. 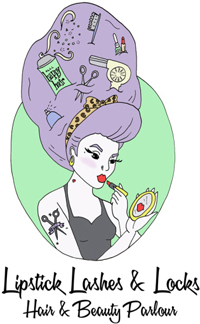 Whether you’re looking for semi permanent colouring or temporary hair chalks for the evening, Loretta is the gal to call… Throw in a cheeky stencil undercut and you’ll never want a ‘regular’ hair cut ever again! Tina, our master Cut Throat Shaving artist, has been perfecting gents Gomez Addams look for Halloween! Book yourself in for a Luxury Hot Towel Shave if you’re going for a sharp and smart dapper do, or make an appointment to Tame that Mane and get the best beard trim and treatment in town! To make an appointment or to have a chat with Loretta, Gemma, Jenny or Tina about the treatment you wish to book, call us on 0131 281 1942 or email us at info@lipsticklashesandlocks.co.uk we’re more than happy to throw around some ideas if you’re not sure what you’re looking for!